If you have a backyard space at your home, you’ve likely considered which items are best to keep in that space to keep your kids occupied. If you install a wooden playset in your yard, it can inspire your children to spend their free time outside rather than on an electronic device. This will provide them with plenty of exercise and also ensure that they don’t spend too much time in front of a screen. 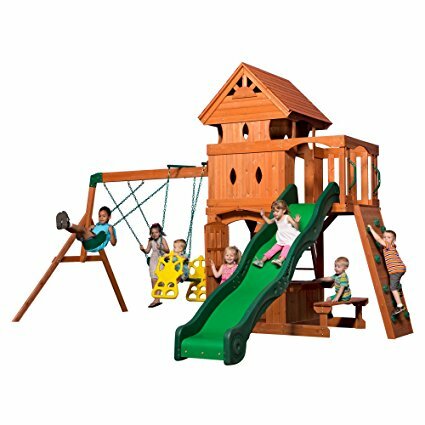 There are many different types of playsets for the backyard and they are available in different sizes to suit different size budgets. 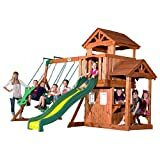 When choosing among the different wooden swing sets and play sets for your backyard, you should consider the ages of your children. Many sets have different features that can easily be used for very young children through pre-teens. Wooden sets can also be long-lasting even when left outside during inclement weather. If you live in an area where you have a lot of damp weather, be sure to choose a set that is made with treated wood that can last for many years of play. 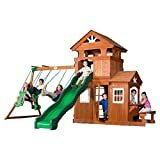 The following is a list of the top 10 wooden swing sets and playsets. The Big Backyard Magnolia Wooden Play Set has a shiplap wooden roof that is stylish and functional. This play set comes with a chalk wall tarp that allows kids to write on the tarp and easily erase it when they want to write again. The set has 2 stool seats on the side for snacking or doing other activities. This wooden play set has two play phones for imaginative play with friends. The set includes a sandbox under the upper play area that helps to keep the sand dry. 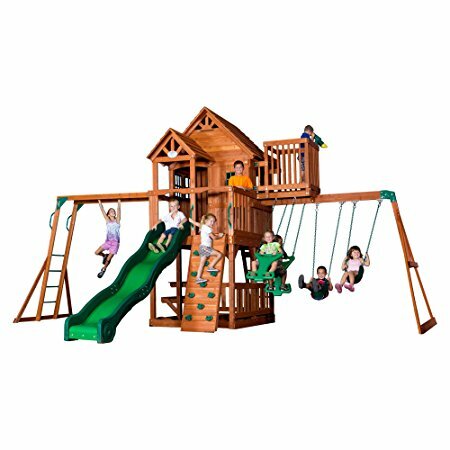 The set can accommodate up to 8 children at once with the included slide, play fort, rock climbing wall, two belt swings, and an acro bar. The upstairs area also has a flower boxes for decoration. 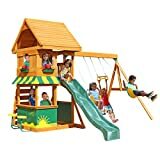 The Backyard Discovery Pacific View wooden play set is made with cedar wood that is durable and long-lasting. This set includes a standard ladder and a rock-climbing wall for an extra challenge. The fort on the play set has an upper playhouse and sun porch for reading, playing, or relaxing. This play set from Backyard Discovery has a lower level that includes a sandbox and a picnic table for having snacks. The included slide is 10 feet long and is safe but also speedy to ensure that children don’t get bored. 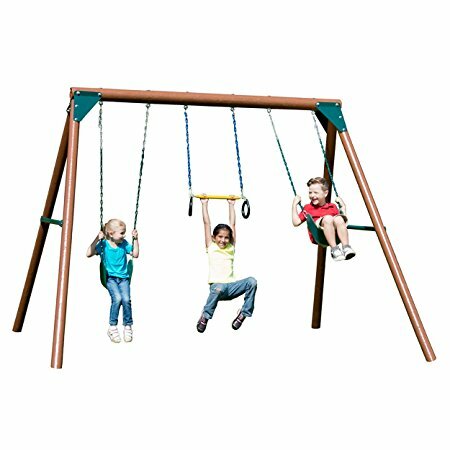 The set also includes 2 belt swings and a glider swing that can be used by two children at once. 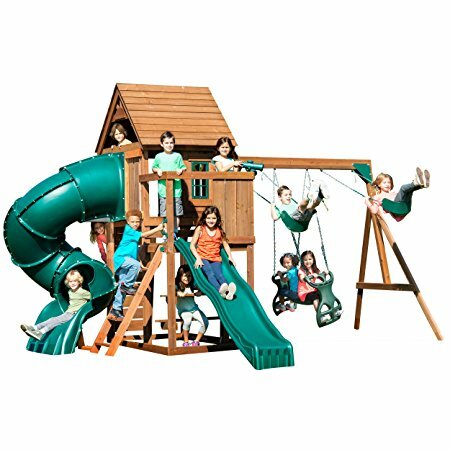 The Swing-N-Slide Tremont tower play set is made by a US-based company that focuses on creating outdoor play spaces that are fun and safe. They test each set for safety before it’s sold. 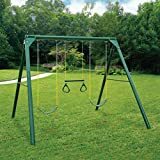 This set is ideal for those who have a large yard and plenty of space for a swing set with many different features. This play set from Swing-N-Slide includes 2 slides: an enclosed turbo slide and a wave slide. It also has a playhouse with roof and 2 swings, a glider, a telescope, and picnic area. The set is made from pre-cut lumber that has been treated for weather resistance. The set has poly-coated uprights and comes with all the hardware and instructions needed for assembly. The Backyard Discovery Shenandoah play set is made with all cedar wood for long-lasting play. This set comes with an upper play fort with a slide. The lower level also has a covered play area with a bench and window for imaginative play. 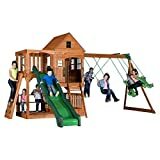 This play set from Backyard Discovery has two standard belt swings and a two person glider. This set works well for children of all ages. The upper level has a standard ladder to climb to the top or a rock wall to provide kids with a fun and challenging climb. The included slide has a durable and safe design. 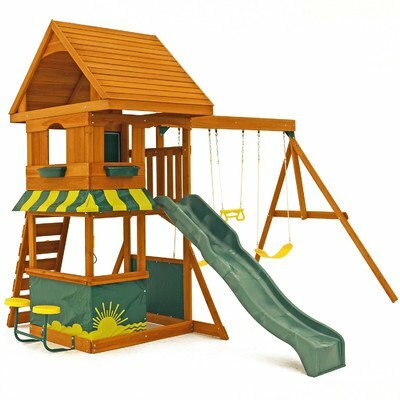 The Cedar Summit Play Set is manufactured with 100% cedar lumber for durability. This set comes with a 5-year limited warranty on the wood. The set is designed for use with children from ages 3 through 10 years. It can accommodate around 10 children at once and is ideal for large families or those who often have friends over to play. This play set from Cedar Summit has a large upper deck with flower boxes for children to plant flowers to add to the enjoyment of your outdoor space. The set also includes two swings, a double-swing, a twisty enclosed slide, and a lower level designed to resemble a playhouse. The Backyard Discovery Tanglewood all cedar set has a heavy duty design that can stand up to years of usage in your yard. This set comes with 2 belt swings and a two person glider. The included slide is 8 feet long and is designed to be speedy but also safe with high walls to prevent falling off the slide. This set from Backyard Discovery has an upper fort and a lower playhouse for plenty of space to play in the shade on hot days. The lower fort has windows and a snack window with a built-in bench. The set also includes a rock climbing wall that allows kids to have a challenging climb to the upper level of the structure. The Backyard Discovery Skyfort II comes with 2 belt swings, a swing glider that can be used by 2 children at once, a slide, and monkey bars. 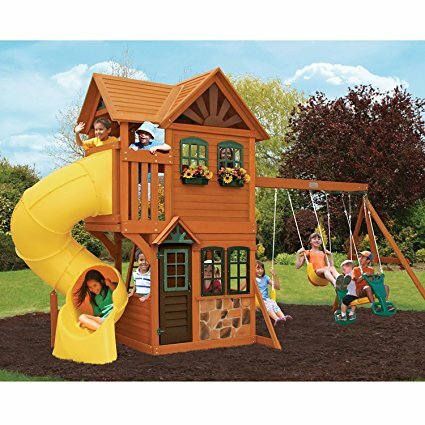 This large play set also has an upper playhouse and a lower covered area for playing. The lower level also includes a sandbox and a picnic table with benches that can accommodate 4 children. 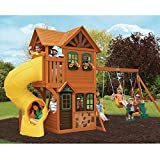 This playset from Backyard Discovery has a roomy front porch on the upper level along with a crow’s nest. The set has a 10 foot slide that has high walls for safety. Children can use the traditional style ladder or the climbing wall to access the upper level. The Cedar Summit Brookridge wooden play set is an affordable option for those looking for a smaller play set for a yard that doesn’t have a lot of space. This set is made of durable cedar and is designed to last through many years of use. This play set from Cedar Summit has a multi-colored canopy on the roof to allow children to have a nice spot to play in the shade. The set includes swings and a slide. The wood for the set comes pre-cut and pre-drilled for a quick and easy assembly. The Backyard Discovery Monterey cedar wood play set has a clubhouse and a play fort. 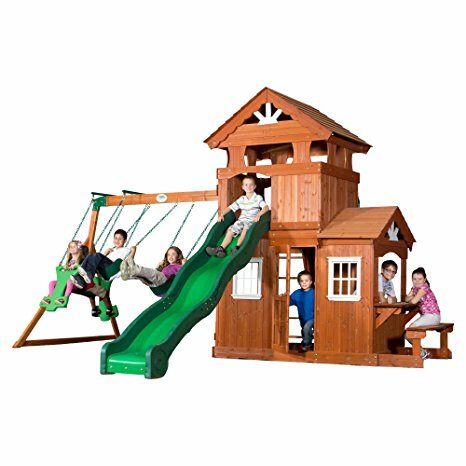 This set is manufactured of durable cedar with a heavy duty wooden roof for many years of play. It comes with 2 belt swings and a 2-person glider. This play set from Backyard Discovery has a strong and sturdy slide with tall walls for safety. Kids can climb to the upper level using the standard ladder or the climbing wall. The set also includes a door on the lower level and a bench and snack window for imaginative play. 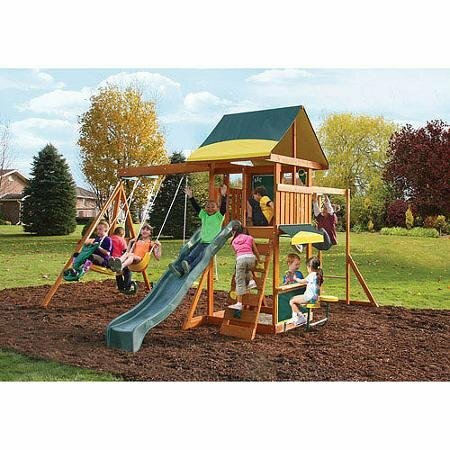 The Swing-N-Slide Orbiter wooden swing set is an affordable and compact option for those who don’t have a lot of space in their yard. This play set comes with 2 swings and a ring-trapeze combo. Also included with the set is all the hardware needed for installation and the instructions for a quick assembly. This play set from Swing-N-Slide has been safety tested and meets all ASTM safety standards. The set is made of durable wood and is designed to be safer and sturdier than metal sets. The posts included with the set are maintenance free and they come with a limited 5 year warranty. Adding a play set or swing set to your backyard space can provide your children with a safe place to spend time outdoors. It can also encourage them to play outside rather than to spend all their free time using electronics. There are many different play set options for use in different size yards. There are also sets for all different budgets. Wooden swing sets are designed to be durable and long lasting so that you can have a fun place for your children to play for many years. When you’re shopping for a wooden play set for your backyard, it can be helpful to do some research before you make the purchase. You can also read online reviews from other consumers to find a set that is made well and designed to last. There are sets that are designed for use with children of all ages. Most sets can accommodate several children at once which benefits larges families or those who often have neighborhood children visiting their yard.